How far would you go for R25,000? Clearly this woman is going to extreme levels for her shot at entering the #SecretSound. 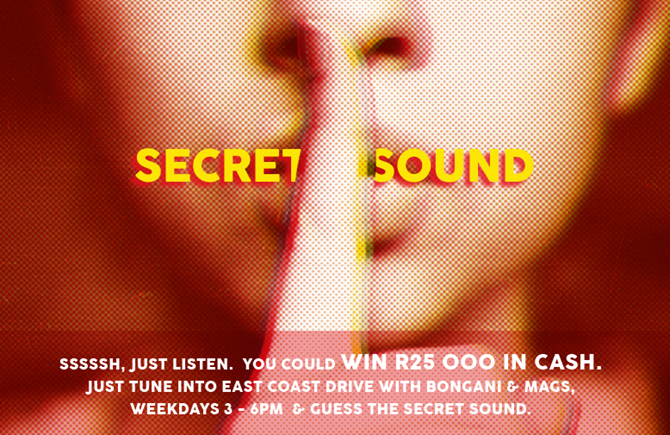 KZN listeners have been trying their luck to grab R25,000 by guessing what the #SecretSound is since the beginning of February, but so far no one has been successful. After having given listeners the chance to guess what the Secret Sound is, Bongani put listeners to the test by asking them what the craziest thing they would do for five guesses is. Read: Are you able to guess what the 2018 Secret Sound is? A Durban woman named Margie has publicly revealed that she is willing and eager to have the words 'East Coast Radio' tattooed on her body live in studio this Friday in exchange for five guesses. Life is a process of elimination, so be sure to tune in on Friday to the other incorrect guesses. Don't miss any of the action.